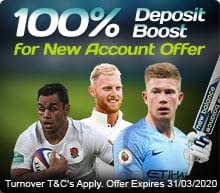 Earn a top-up boost of up to an amazing £/€1000 on your first deposit. 1. Open and Fund your new Sports Spread account. 2. Once you deposit, email info@sportsspread.com to claim your bonus. 3. 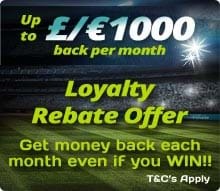 For example, if you deposit £1000, we will credit your account with a £1000 bonus. 4. The maximum qualifying deposit per client is £1000. 5. Offer applies to new accounts only. 6. Clients must turnover the deposited funds plus the bonus funds a minimum of two times. We calculate turnover by multiplying stake size by half the width of the spread and not cumulative wins/losses on bets. SportsSpread defines the spread concerning the turnover calculation as the mid-point of spread to the price dealt at or half the width of the spread. Please note that if you take up the offer and use the bonus funds as margin for your trading, then you cannot withdraw from the promotion and give up the bonus funds. Due to the generous nature of the promotional offer, we must ensure that the terms and conditions will not be taken advantage of in any way. If you deposit an amount more significant than you require for your regular betting to get a more substantial bonus, then you will not reach the turnover requirement for a prolonged period, as we base the turnover on your trading only. The majority of new clients will attain the necessary turnover level within 4-6 weeks providing they have deposited an amount commensurate with their trading levels. If you lose the bonus and the deposited funds without having reached the turnover requirement, then the condition will be removed from the account, but this is at the discretion of SportsSpread.com and is not an automatic entitlement. Any collusion between new account holders who take up the offer to attempt to garner the bonus funds without risk will result in all associated accounts immediate closure and all funds in the associated with the accounts will be forfeit.